To say a place is cursed is a bold statement. That is how it felt. To us, Cromer was cursed. It all started in August 2018. We had planned a UK road trip in our van. Samantha, Winston and I would visit Norfolk, Kent, Dorset and South Wales in a circular drive around the southern part of the UK. This had to be cancelled and a scaled down version, (but no means less enjoyable,) was undertaken around the Welsh coastline. Winston’s illness, and frankly near death experience, made the Summer of 2018 very stressful. Fast forward to October 2018 and we had another North Norfolk adventure planned. We were all set to go, when our oven at home decided to die on us. Unfortunately, sometimes, adult life steps in and ruins any bids for freedom you may have conjured up! The town of Cromer is much like many British seaside towns. A busy high street, narrow side streets with victorian buildings which are wider on the third floor than on the first. Leaning in towards you like overpowering guardians watching you walk towards to beach. Cromer differs from some seaside towns in the fact it appears to be build on a cliff top so therefore steep steps, and a later made ramp, are required to make your way down to the promenade and the typical, if not, ornate pier. The prom has various cafes, shops and amusements spread along its concrete walled defences. The beach itself is a stretch of stoney, pebble littered shoreline interspersed with dilapidated tide breakers. Patches of golden sand are occasionally visible when the rocks have been shifted by a tempestuous northerly swell. We beachcombed along the rocky ground. Climbing over the wooden fences and breakers like a giant abandoned castle. We found driftwood, smoothed pebbles and sea glass like jewels. Norfolk flint was everywhere. Eroded into various shapes, many with holes bored right through them to create eye like shapes across the surface of the beach. We made our way past rows of cute beach huts in many different colours and stages of decomposition. I couldn't help but love the wonky and rotten ones a little more than the perfect striped candy cane holiday cabins. I could imagine an artist sculpting a masterpiece in there or a reclusive poet with his words flowing out, like the ink from his pen, onto a jotter for no one to read. The cliffs towered above us, looking fragile and crumbling onto the beach. We found a steep path winding up the cliff, cut into the sandy ground by others footfall, leading to Warren Wood. A tiny country park with dispersed broadleaf trees and wiry, stubborn, and thorny, gorse. Their yellow flowers not hoodwinking me to forget their sharp lances. 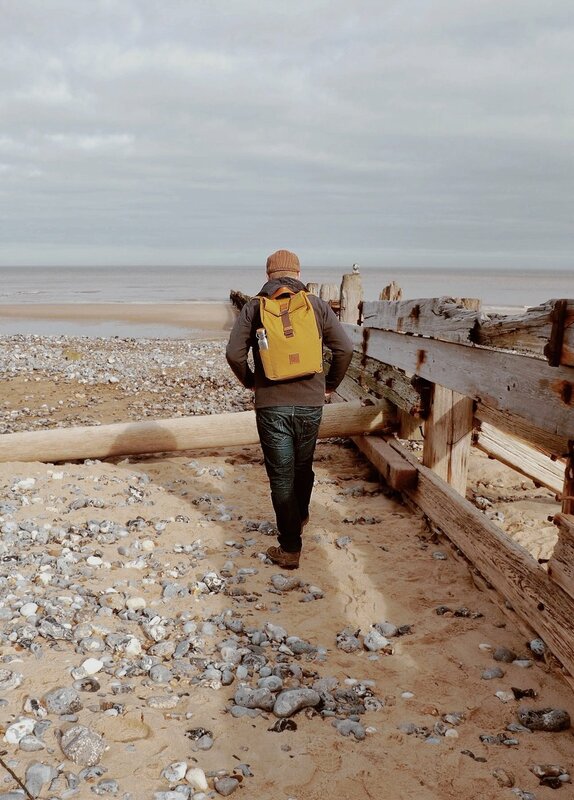 We explored the parkland and marvelled at its endless coastal panoramas. The church spire, of the Norman church near our bed for the night, was just visible above the trees to remind us of the undulating and contouring landscape around Cromer. After a while we found a lighthouse within the park. A small and somewhat stunted building of brilliant white paint. Its glass domed top was reflecting the sunshine down towards our feet. The path around the park continued past large beach houses and rooftop gardens until it reached the bustle of its tourist lined streets again. We had ventured no more than three miles from the bustling town and found a tranquil, lonely spot but not at all troglodytic. The contrast of the two places was more obvious than I could of imagined! 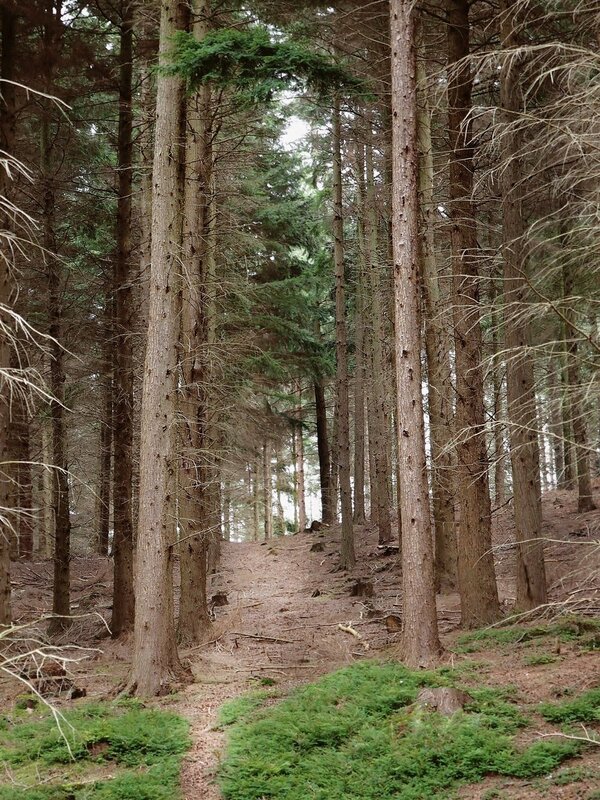 Stretching across 206 acres is Weybourne Woods. A mixture of broadleaf and pine trees which nudges up to Sherringham Park. We came across the area of woodland when we alighted the steam train from Sherringham to Holt. Firstly we made our way into the Hundred Acre Wood and quickly climbed up to a ridge line surrounded by Oak, Ash and Beech. After we emerged from the trees we found ourselves with two options. 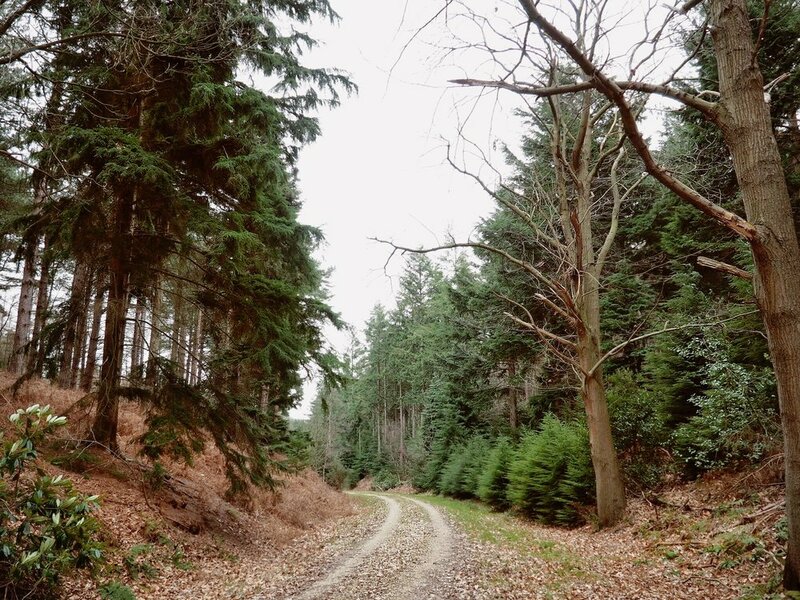 We could follow the road back to the train to continue our journey to Holt, or, we could climb the stile in front of us and venture into an inviting avenue of tall green Scotch Pines. I am at an ever changing viewpoint with pinetums. The UK should be awash with Oak, Beech, Holly and Elder. Yew trees should grow from a lush green forest floor amongst ferns and grasses. All of which would support a strong wildlife community. A pine forest is a dark, moody and stark place. The air is devoid of brute creation and sometimes it is so silent you can hear a pine cone fall onto the bed of cushioned needles on the floor. The busy treetops, metres above your head, block a lot of the natural light and therefore the earths canvas is brown and dead. Even though all of this is true the air holds something rather special, a certain magic. The air is close and dense making you feel a part of the forest. It is as if the soul of the forest is entering your skin. Your mind runs wild. Maybe the life in pine forest is just not visible. It could be behind every tree trunk, over every root and around the next corner. Visible behind the first few rows of trees were our idea of woodland heaven. In-between the pines were the most perfect A-Frame cabins gathered in a horseshoe pattern. We stood and dreamed about living in the woods and becoming nomads. We followed a simple path through the forest until it looped back to where the steam train was waiting to carry us along to our next destination. 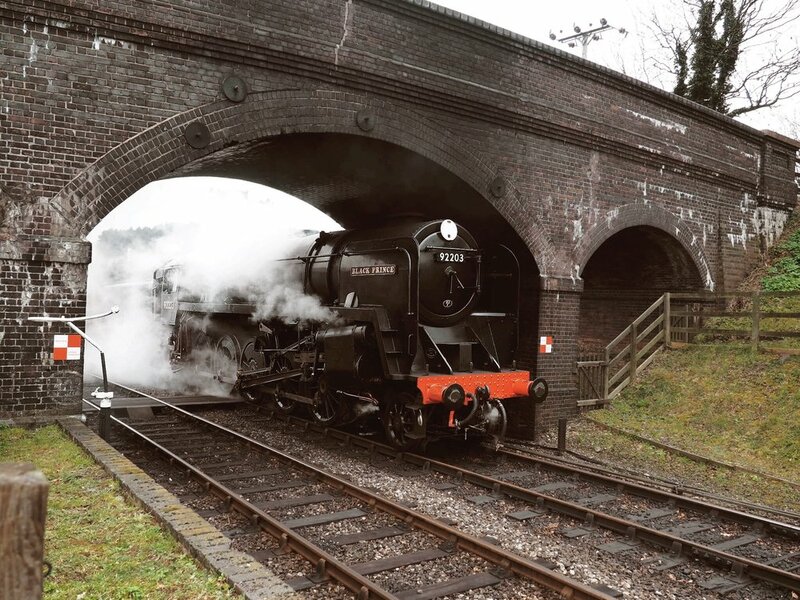 The Black Prince pulled us through the countryside in style. The North Norfolk Steam Railway is a heritage steam railway between the towns of Sherringham and Holt. It passes through preserved woodland, country parks, next to windmills and nestles itself amongst the busy Norfolk wildlife. A mixture a steam and classic diesel trains transport you on the short, but fun, five mile track. 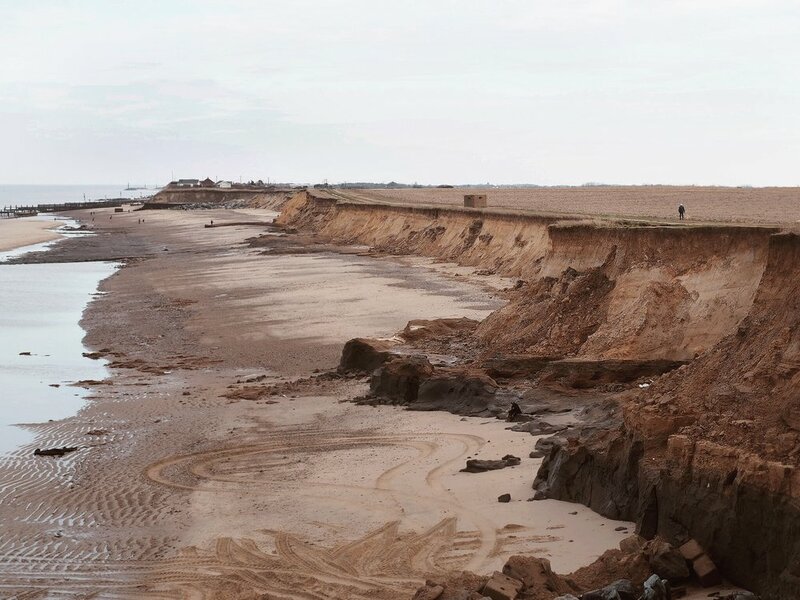 Overlookingthe erosion sites at Happisburgh. ﻿The next day we headed east along the coast. There is no quick way to negotiate the Norfolk lanes. All roads lead inland before heading back towards the North Sea to each individual coastal town. Our destination was the village of Happisburgh. A site of huge importance archaeologically and environmentally. In May 2013 a set of human footprints were dated back to the early Pleistocene era, (over 800,000 years ago). These are the oldest known hominid footprints outside of Africa. The village is subject to coastal erosion and homes are frequently lost into the sea. Numerous groynes have been erected but so far the sea continues to consume the land. The cliff edges are a crumbling mess. The soft sandy edges can often be seen falling into the sea. The coast path weaves around the saw tooth frame of our country. Nothing much left of this groyne. Standing only a few hundred metres, (maybe less now), from the cliff edge is the Happisburgh lighthouse. A perfect red and white striped obelisk that was somewhat of a alien in a sandy field. The privately operated lighthouse will eventually be lost into the blue with the rest of the village. This makes everything feel very fragile and reminding me that you have to respect the natural world. We are nothing more than passengers on a great adventure. We have experiences we can enjoy and mountains we can conquer. All the time we have to remember to fear what the laws of macrocosm can do. We only had one day left in Norfolk before we headed back to work. We’d seen so much during our mini adventure. The historic railways and lighthouses, the eerie and enchanting woods and we enjoyed the undisturbed act of beachcombing. Our minds were completely refreshed from the tranquil locations we had visited and sights we’d seen. We still had time for one final sojourn. A crescendo to bring the holiday to a fitting climax. Heading west along the coastline from Cromer we pointed towards Wells Next The Sea. A assiduous seaside village with tonnes on offer. The village is a harbour port dating back to 1859 when land was reclaimed to form a mile long sea wall. We drove along the wall and parked at the end amongst many other visitors. For the first time on our Norfolk travels we felt as if we were with droves of tourists and holiday makers. The large gravel car park, filled with families and their relentless supplies of buggies, buckets and ball-games irritated me. I am not a fan of following the sprawl of other families to the same holiday destinations at the same time. We had avoided crowds up to this point and I was starting to think we had made a mistake in coming. More of those perfect huts! We had heard exciting claims about the beach and surrounding woods so we scanned around for a sign. A sign to lead us away to a more peaceful part of Wells Next The Sea. 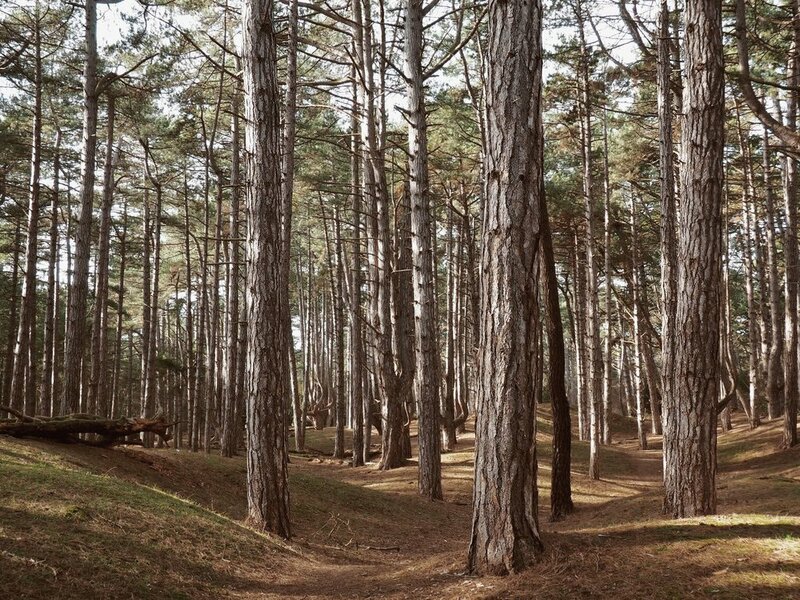 The northern edge of the gravel car park was lined with tall, almost grey, dense pine trees. We headed towards them and we quickly found a path into them. The ground was so soft underfoot with a mixture of needles and sand providing a cushioned bed to walk upon. The path quickly took the reins as our minds got soothed amongst the trees. Before we knew it the path took us over an embankment and down onto golden sands. The bright sunshine, that had up to this point been hidden from us by the close-knit treetops, was energising. Our paced quickened as if we were rushing towards the sea. A attempted quick dash towards the North Sea would be foolhardy to say the least as it was barely visible to us. The vast sand was only broken up by brine pools waiting for the ocean to come back and become accustomed with them once again. The limitless sands were home to Lapwings, Oystercatchers and Marsh Harriers. All taking to the skies as families and dogs made their way towards them. The crowds that were at the car park had vanished and as I looked along the shining beach I wondered where they had gone. Only the more intrepid children had dragged their families this far along the beach. 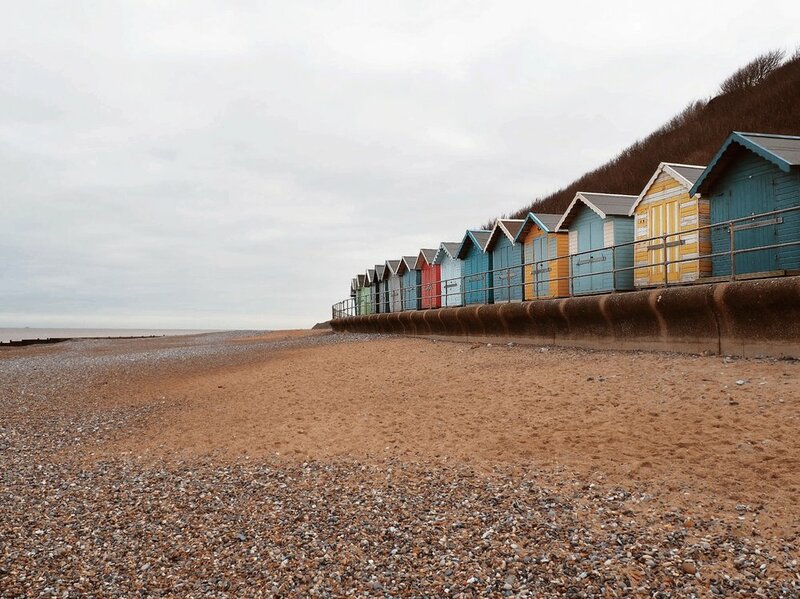 We marvelled at the colourful beach huts. Again, like in Cromer, I imagined a life in one of them and what those tranquil four walls could conjure in my mind. Upon reaching the end, of what must of been 100 beach huts, we arced back towards the trees. 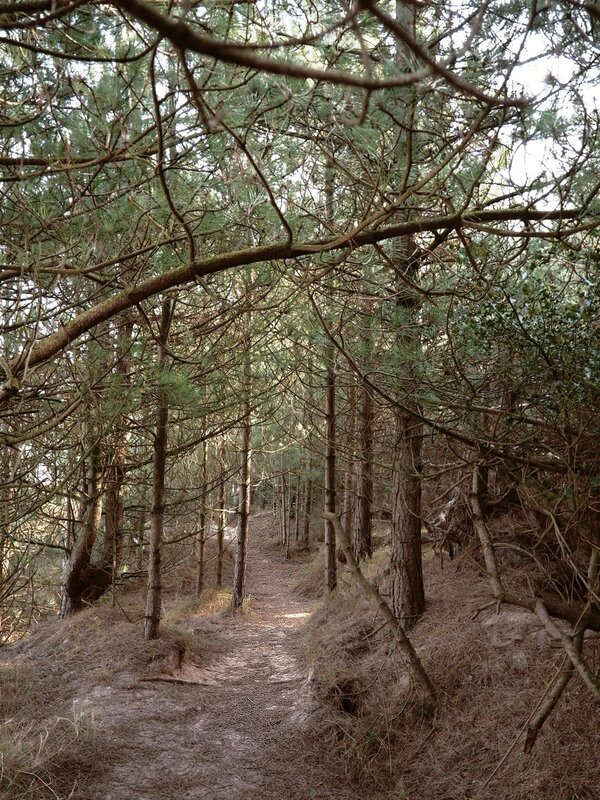 Walking amidst the soaring pines, which make up a part of the Holkham Nature Reserve, our spirits calmed yet again. The excitement that beaches and the ocean always brings us traded placed with a serene and comfortable outlook. As I have mentioned before, in much of my writing, there is just something magical about trees. Scots Pine shared the bolstered floor with Corsican and the fitting Maritime Pine. Some trees had fallen in the storms over the last few years and therefore the woodland was full of glades and clearings which let streams of warm glowing sunshine in. We perched on a fallen Scots Pine to eat some lunch and survey the area. Grey Squirrels busied themselves above us in the sprung evergreen branches. Blackbirds and Chaffinches amongst other ground feeding birds collected seeds, and probably picnic scraps. A few other people walked near us but all kept to themselves. Happy with their own little bit of woodland, their special haven. Once nature had given them what they came for they left it as they found it. My first impression of Wells Next The Sea was unjust. We ventured only a few hundred metres from the bustle of British tourism to find a peaceful oasis of pure nature. It took us three attempts to visit the Norfolk coast but it was worth the wait. I certainly found tranquility in Norfolk.